Though emergency relief materials, including food, water, water purifiers, and medical supplies, are being sent to Nepal from all around the world, most of these are stuck in government warehouses yet to reach the people, thanks to our utterly incompetent government who’s interested more in following ‘protocols’ and ‘procedures’ than in helping its people during a time like this. Frustrated by the government’s slow pace at mobilizing relief materials, several local youth have partnered with local and international non-government organizations to get the job done themselves. They are collecting funds to purchase medical supplies, food, water, tarps, sanitary products, blankets, clothes, and other essential commodities and taking these items to far flung areas where government relief materials have not yet reached. Child Reach Nepal is one such organization that is working on the ground. This organization, along with local youth volunteers, were the first to reach Sindupalchok—a district north of Kathmandu that was totally devastated by the earthquake—to distribute emergency relief materials. However, due to the sheer number of affected people, these organizations need more funds to help those who urgently need temporary shelters, food, water, and medicines. 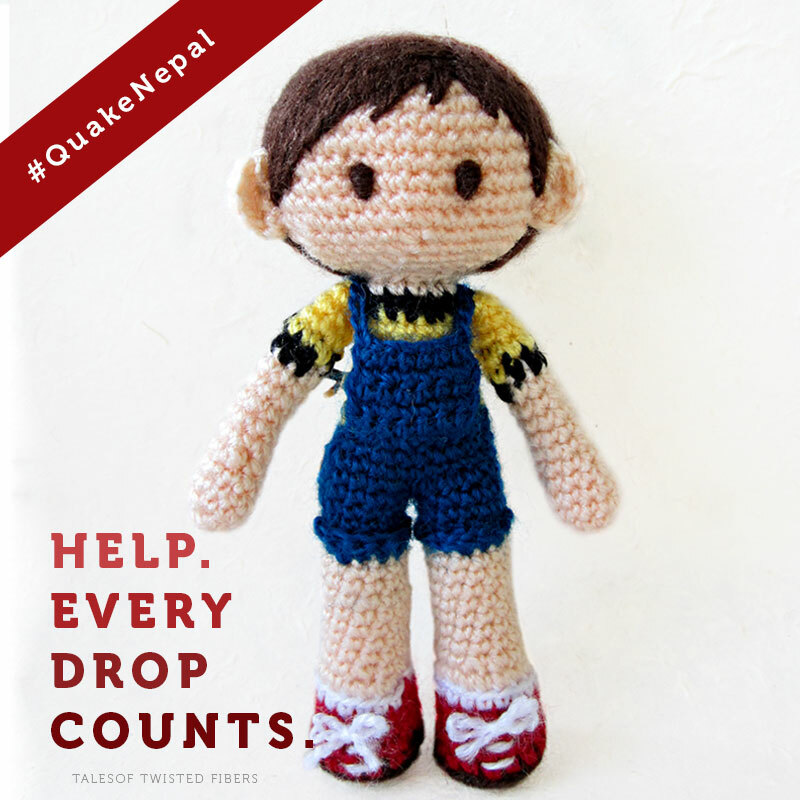 You can help Child Reach Nepal in its relief efforts by donating here. Another organization that needs your support is Animal Nepal, which has been rescuing and treating animals affected by the earthquake. Some of their staff members have lost their homes. A couple more are yet unaccounted for. The organization’s donkey sanctuary has been partially destroyed by the quake. Yet this team has not stopped its efforts to help the animals who need our help more than ever. You can give Animal Nepal a hand by donating here. 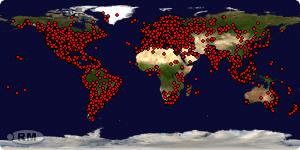 For a list of verified organizations that are currently engaged in emergency relief, go here. And to thank you for donating to any of these organizations, I’m giving you a free amigurumi pattern for the little kid known as “the Naughty Boy”. It is one of my first patterns, designed back in 2013, which I hadn’t released earlier. Please note the pattern writing format is slightly different and the pattern is untested. So if you come across any errors, please be kind enough to let me know. Pleased to hear of your safety. Our hearts go out to Nepal. Reblogged in order to help. Hi Serah, Thank you for the pattern, I have donated from my bank account. Keep safe and I hope more survivors will be found soon. Thank you so much for your help, Doreen. There are so many people who are homeless, hungry and injured. Your donation will certainly help these organizations in reaching emergency relief to these people. Leave room for miracles Serah. You are one and all the survivors they have taken from the rubble. Let your heart be strong, your mind at rest….even though we are worlds away love is spreading help is coming. I reblogged this post on Raverly group – Beesteboel. So I hope more dutch and belgium people can help. I did a gift on the child reach Nepal. Also donated some money to a action here in the Netherlands for Nepal. But that money is going to the red cross fundation or other helping organisations. I was really releaved that you are doing fine. So thank you for taking the time to answer me and the others. And making this blog post! Oh no. Another heavy Earthquake. I would be so scared. A great idea for a crafter to share her talents and help others. Thanks Serah! How are you doing? Still in shock ? This weekend we Will have an sale outside in our neighbourhood. 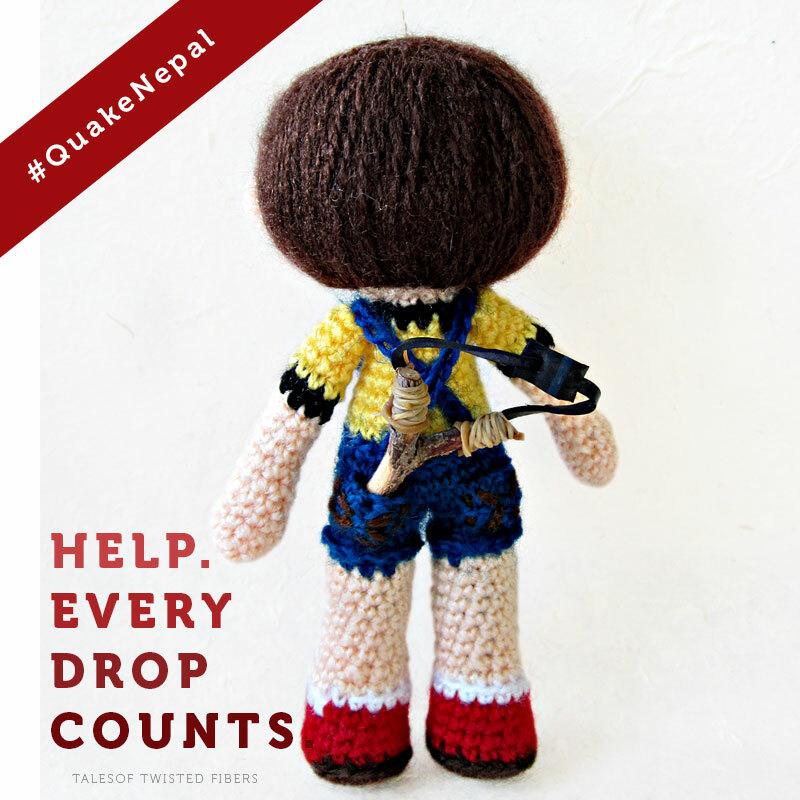 I Will Dell all my crochet animale and dolls for Nepal. Hope i Will raise a lot off money for helping out your country. Glad you made it through okay.